We here at The Gourmet Chocolate of the Month Club™ couldn’t be more enthusiastic to bring you a small chocolatier that is passionate about using fresh and all natural ingredients: Mayana Chocolate. Since their beginning in 2008, husband and wife team Chef Daniel and Tamara Herskovic has taken the chocolate world by storm. 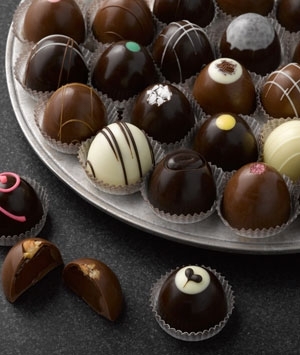 That year, they entered the first Chicago Luxury Chocolate Salon and came home with over seven awards including: Best in Salon, Most Gifted Chocolatier, Most Luxurious Chocolate Experience, and Best Dark Chocolate. More recently they have been featured in several publications, such as, Food & Wine Magazine in February 2014 as an Editor Top Ten Pick, Epicurious as one reason To Blow Your Diet This Easter, and even have been featured a couple of times on the local news. Daniel Herskovic didn’t always dream of chocolate. In fact, since the first time he picked up a guitar at the tender age of 12, he dreamed of becoming a classical musician. Later on with guitar in hand, he enrolled at Kalamazoo College for a brief time before going on to teach English in the Ukraine. After 18 months, he returned in 1997 and enrolled in Oberlin College where he began a double major in Classical Guitar and Russian. During his junior year, he realized that he loved studying world cultures and he just needed to find a way to make a living at it – that’s when he had the epiphany that food is one of the best ways to explore the world and different cultures. So during his senior year, he took a class that did just that and a new passion was born. After college, he enrolled in the California Culinary Academy in San Francisco to begin his journey as a world-class chef and completed the chef program in 2000. He made his way to New York for a brief time before heading back to California to work at the acclaimed Oliverto Restaurant in Oakland, and while there, he started to learn and incorporate the principles of the Slow Food Movement. Within a couple of years Chef Herskovic landed in Chicago to work at the Four Seasons, which he soon left to start his own catering business in 2004. Chef Herskovic’s catering business became the talk of the town and soon well-known CEOs as well as the famous were requesting his culinary creations for any event that they happened to be throwing. As his catering business began to grow, he began handing out chocolate bars to his clients as a post-dessert memento. Soon, his clients were asking for more, so he decided to expand his chocolate making. His first attempts to make truffles turned out to be roughly the size of golf balls! Knowing he needed help, he took courses at the French Pastry School in Chicago, Notter School of Pastry Arts in Orlando, and master classes for professionals. According to Chef Herskovic, he has studied with ten world-class French and American chocolatiers and pastry chefs including Andrew Shotts, Norman Love, Franck Kestener, Christophe Morel, Jerome Landrieu, and Lionel Clement. Armed with a newfound passion for chocolate, Chef Herskovic continued to hand out chocolates to his clients, and when they couldn’t stop talking about them he knew he was on to something. His next step was to find a name for his new chocolate business. While looking at an online photo gallery, he saw the Mayana plant next to a picture of a cocoa blossom and thought it sounded exotic. Thus, Mayana Chocolates was born and opened for business in Chicago. Recently in July 2013, however, Chef Herskovic, wife Tamara, and Mayana Chocolate left Chicago and moved to a small town in northwest Wisconsin. For Chef Herskovic, chocolate making is as much as a science as it is an art and he loves the challenge that chocolate presents due to its complicated nature and the precision necessary to craft it. For example, chocolate is difficult to temper, it’s mercurial in texture, needs to be mixed and cooled at the correct temperatures, and requires the correct amount of cocoa and conching to get the perfect texture and flavor. He uses a variety of different chocolates from all over the world, including places like Switzerland, the United States, Belgium, Venezuela, Tanzania, and France – making sure that all of the chocolate he receives is certified fair trade. Each country’s chocolate will have a slightly different flavor, and according to Chef Herskovic: “The quality of a chocolate isn’t determined by the percentage of Cacao mass; the roasting of the beans and other factors come into play — just like with coffee. Different chocolates take infusions of flavors different, too.” He also seeks out only the freshest ingredients, and with their recent move to rural northwest Wisconsin, Mayana Chocolates has been able to partner with local farmers to ensure that their ingredients are nothing but top quality. 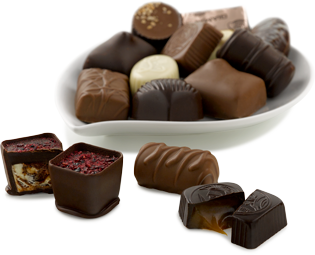 Making the chocolates can be up to a five-day process from start to finish. He starts with chocolate, adds cream, and anything from fruit, nuts, spices, or herbs, and then emulsifies them. For the Mint-Dark Chocolate, for instance, he uses large quantities of only fresh mint leaves. Once emulsified, he adds some soft butter and invert sugar before giving it another stir and then carefully spreads it on a form or mold (depending on the creation) where it needs to rest for 12 hours in a temperature-controlled room. From here, he will layer the ganaches, if needed, then cut the sheets using a multi-wired confectionary cutter called a ‘guitar cutter,’ then leaves them to rest some more before heading off to the enrobing machine that evenly coats each piece with a layer of tempered chocolate. For the finishing touch, he either adheres colorful acetate sheets with intricate patterns and designs or airbrushes them with colored cocoa butter. Once the chocolates are complete, they are hand packed by Chef Herskovic and Tamara (and occasionally with the help of a couple part-time workers). Fleur de Sel Caramel: Handmade caramels using the finest of all sea salts, harvested on the coasts of Brittany, France. Mint-Dark Chocolate: Fresh bunches of pure mint leaves are infused into intense dark chocolate. Earl Grey Tea & Lemon: A burst of fresh lemon that compliments an intensely flavored tea ganache. Lime & Raspberry: A burst of fresh lime juice combined with vanilla beans, Venezuelan chocolate, and a thin layer of raspberry pate de fruit. Peanut Ginger Nougatine & 75% Tanzanian Ganache: Caramelized peanuts and ginger combined with a naturally spicy and rare dark chocolate from Tanzania. Cookies & Cream: A childhood treat encased in fine dark chocolate. Mayan Spice: Dark chocolate ganache with a spice blend of ancho chilli, cinnamon, and cayenne pepper. Passion Fruit Heart: White chocolate and passion fruit ganache encased in white and dark chocolates. Caramelized Cashew, Orange Peel & 72% Ganache: Caramelized cashews and orange peel combined with a naturally spicy and rare dark chocolate from Tanzania. The Kitchen Sink Bar: Peanut butter, pretzel and crisp rice combine with milk chocolate, fleur de sel caramel and their signature 66% dark chocolate. The Mayan Spice: Spicy. Rich. Decadent. This candy bar is for grown folks with it’s rich dark chocolate ganache, sea salt caramel and tortilla crunch. Toffee: Perfect toffee that is tender, deeply caramelized and won’t stick to your teeth. Coated in our custom chocolate blend and loaded with toasted almonds. To learn more about Mayana Chocolates visit www.MayanaChocolates.com.